Join the discussion on our forums! 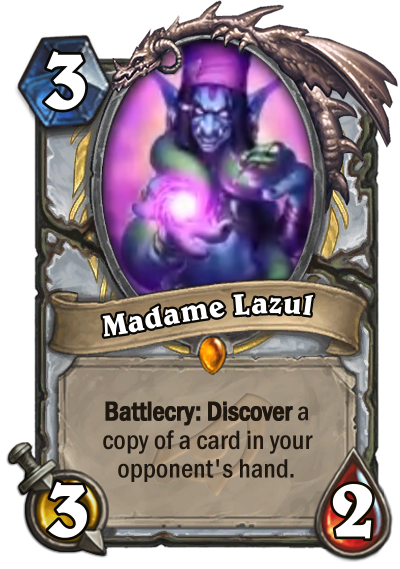 Come discuss Madame Lazul over in our dedicated Madame Lazul discussion topic. Show me 3 of my opponents cards so I can further my Priest-control game plan. Oh, then take a copy of one for good measure. If control priest ends up being in the Meta this looks to be incredibly powerful simply because of the information it provides. Don't compare this to Chameleos. This card is way better, it doesn't need time to give you immediate value. The reason that card was bad was because by the time you got to see your opponents hand it didn't matter.